The orchestral music. The shadows. The moments of steely, determined or anguished contemplation. All of these are present in Rob Reiner's political drama "LBJ" but feel forced and wrongly pitched. Mr. Reiner showcases Woody Harrelson, more than competent in the title role, but everything around him looks like neatly-hallowed empty theater. Things feel too perfect. "LBJ" takes portions of the JFK years and President Johnson's years and plucks out of them in the latter a man who knew the levers of political power as the Senate as its Democratic majority leader and knew how to pull them. Mr. Reiner does this part of his film well but the real horsetrading of politics and dilemma are drowned out by sentiment and an overbearing music score that reminds you of what the film is trying so hard to do. Lyndon Baines Johnson was a Texan and a complicated figure who will be recorded as one of the three most consequential presidents in the history of the United States. (Robert Caro's fantastic books on Mr. Johnson by the way, are a must-read.) Mr. Reiner though, is making a central point that when cast against today's craven realities at 1600 Pennsylvania Avenue, becomes an austere point. The operative appeal to conscience, what is right for a nation in deep crisis -- the Civil Rights Bill and upholding a Kennedy goal he was in reality very slow to adopt before pressure from Dr. Martin Luther King and others -- is the thrust of "LBJ". Put what is morally right above what is politically expedient. Mr. Reiner depicts a sensitive, blunt man who wanted to be liked, which in politics is anathema. Politics is no place for sentiment but Mr. Reiner -- instead of letting a journey and crisis unfold -- rams home emotion through the end zone in a film that doesn't need much of it. 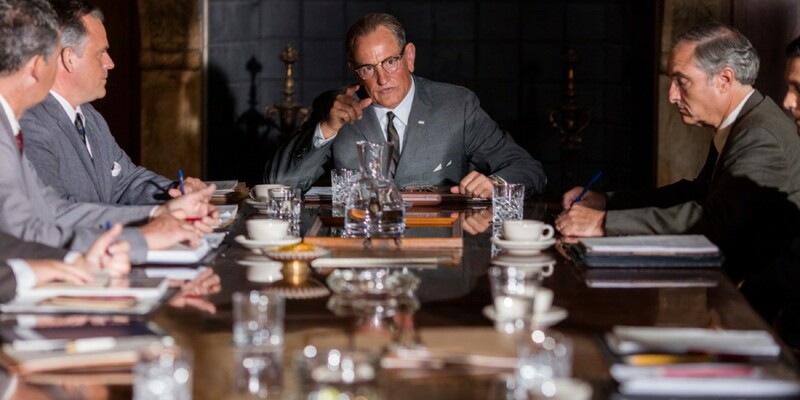 Mr. Harrelson gets the heft and depth of LBJ right and Richard Jenkins has an accurate angle in his portrayal of staunch Dixiecrat senator Richard Russell. It's too bad the rest of the film doesn't breathe, rushing from one episode to another. There's too much talking about things, too much telling and not enough showing and conveying in "LBJ". That usually means the screenwriter, in this case Joey Hartstone, did not get the balance right. A little more patience and development was needed. The real LBJ was hardly upright on race given his voting history as a senator -- and also as a Congressional member -- voting against anti-lynching laws. Yet even LBJ understood, thanks to the persistent advocacy of Dr. King and a sweeping movement shockingly absent from "LBJ", that people-powered movements and events dictate political outcomes more than anything else. It is leaders who follow. Also with: Jeffrey Donovan, Michael Stahl-David, Jennifer Jason Leigh, Bill Pullman, Gary Grubbs, Judd Lormand, Brent Bailey, C. Thomas Howell, Thomas Francis Murphy. "LBJ" is rated R by the Motion Picture Association of America for language. The film's running time is one hour and 37 minutes.